The Lockheed Martin GRAIL team applaud the successful deorbiting and impact of their twin spacecraft on the moon. LITTLETON, Colorado – Flight controllers here purposely plowed NASA's Ebb and Flow spacecraft into the moon Monday (Dec. 17), ending the agency's Gravity Recovery and Interior Laboratory (Grail) mission. 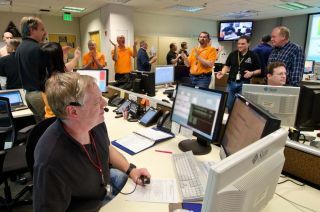 Engineers at Lockheed Martin Space Systems near Denver built the twin spacecraft, and gathered to watch their demise. In a packed Mission Support Area, technicians watched as the probes lowered toward lunar terrain. As the spacecraft depleted their remaining fuel, a technician exclaimed, "Hang on for the ride." With the conclusion of Grail, Spath said, team members have already started to migrate to other company projects, specifically the NASA InSight Mars mission launching in 2016 and the OSIRIS-REx sample return mission to an asteroid. "It's Miller Time," said one engineer looking at his screen, which was showing red lines as Ebb and Flow literally cratered into the moon about 30 seconds apart. Handshakes and hugs all around was the scene. The Grail flight system includes two nearly-identical Lockheed Martin-built spacecraft whose designs are partially based on two successful missions. Grail's "bus" structure — the main body of the spacecraft — and propulsion system owe their heritage to the Experimental Small Satellite-11 (XSS-11). The orbiter's flight avionics and software are akin to those used on the Mars Reconnaissance Orbiter (MRO), also built by Lockheed Martin. Grail's bus is a rectangular composite structure and includes two fixed solar arrays. The propulsion system is a warm gas system that creates a precise, lower-energy thrust when used for maneuvers. During the four month cruise to the moon and the mission's extended science phase, the Grail twins were flown by controllers here at Lockheed Martin's Mission Support Area. Even though the orbiters flew in a precise formation, each spacecraft was operated as a completely separate system. Mission accomplished! The GRAIL team at Lockheed Martin near Denver pose in their Mission Support Area after the Ebb and Flow spacecraft were sent crashing into the moon. Even in their last gasp, Ebb and Flow may cough up science. The still orbiting Lunar Reconnaissance Orbiter was being used to search for signatures of an impact gas plume arising from the dual spacecraft impacts. LRO's Lamp instrument was poised to observe the two impact plumes shortly after LRO crossed near the moon's north pole, said Kurt Retherford, LRO-Lamp principal investigator at the nearby Southwest Research Institute in Boulder, Colo.
"However, because of the small size of the two Grail spacecraft, the high altitude the gas cloud must reach to be seen in sunlight, the challenging viewing geometry, and the fact that the impact sight is expected to be depleted in volatiles rather than rich in them as for LCROSS [a previous moon impactor mission], it is entirely possible that no signals will be measured for this event," Retherford said. "Still, we'd hate to miss such a rare opportunity for gathering more information on the high-latitude regions of the moon and for studying the nature of such impacts. So we'll be looking hard," Retherford said. Yet another LRO sensor —the Diviner instrument — will also be searching for a thermal response at the impact site itself, but some uncertainty in the final viewing geometry exists there too. In a related development, the projected crash of Ebb & Flow near the lunar north pole will create an archaeological site of technological debris leaving material and physical evidence of our most recent exploration of the moon. That's the word from Beth O'Leary in the department of sociology and anthropology at New Mexico State University in Las Cruces. She is a leading champion for preserving sites on the moon for historical purposes. "I trust that, in part, consideration of the Apollo sites which lie around the lunar equator, steered the planned crash location," O'Leary said. "We still have much more to learn about the moon but future missions need to always consider the effects of their undertakings on the significant historic sites which are critical parts of our lunar legacy," she told SPACE.com.